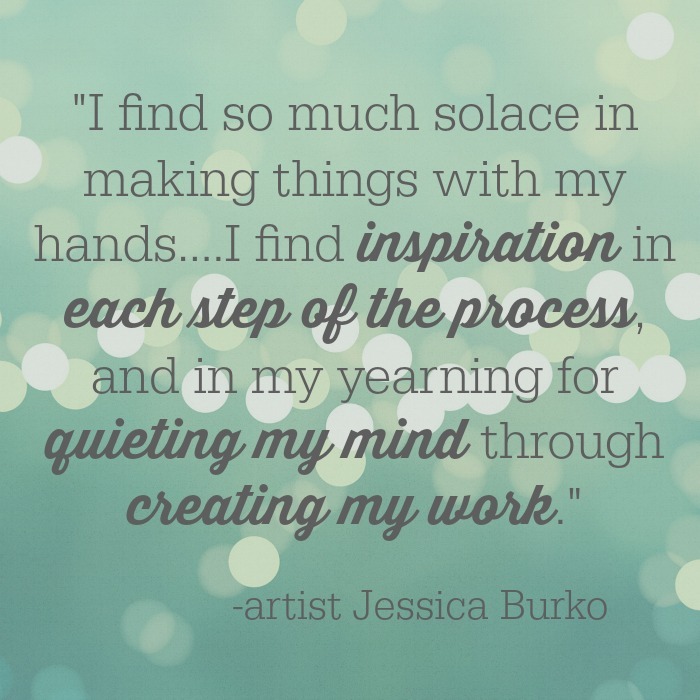 I came to know Jessica Burko, this week’s featured artist, through Boston Handmade, a group of Massachusetts-based artists and craftspeople of which I am a proud member. Jessica is an incredibly energetic, passionate, and bubbly woman who creates fantastic and really unique mixed media art. I finally had the pleasure of meeting her in person this past Sunday and got a glimpse into her studio in the South End neighborhood of Boston. Jessica has been a working artist since 1985 and an independent curator and arts marketer since 1997. Her artwork has been exhibited in venues including the Danforth Museum, the Rochester Museum of Fine Arts, NH and Samson Projects Gallery. As an independent curator with more than thirty exhibitions produced since 2001, Jessica regularly connects with a wide breadth of creatives and in 2007 founded the artist collective Boston Handmade of which she is currently Executive Director. To help artists achieve their creative and professional goals Burko regularly lectures and leads workshops for artists with organizations such as The Arts and Business Council of Greater Boston and the Arts Foundation of Cape Cod. 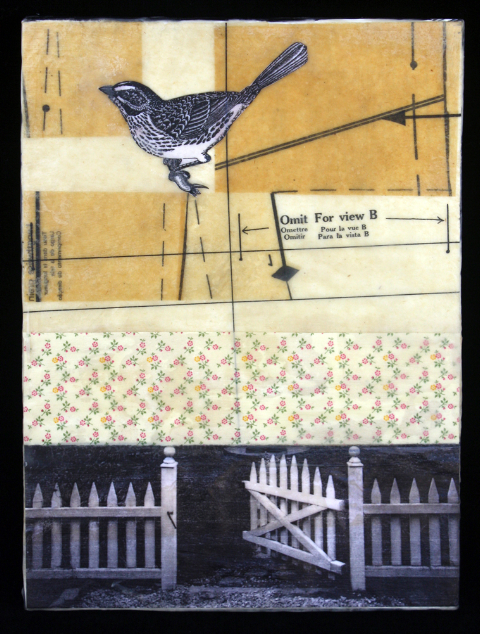 My work can be generally described as mixed-media and is comprised of paper quilts (paper and photographs stitched together with thread) and encaustic collage made from original and found materials (encaustic is a wax-based medium). Photography is the root of my work and is where my ideas and imagery originate. I got a bit of an early start in the arts since my mother is a painter and my father was a writer, so I was photographing, developing my own film, making wet-process photographic prints and exhibiting them at the age of 10. I began to explore mixed-media after seeing a Barbara Kruger exhibition in 1990 and I continue to experiment, explore, and invent with various media today. The best part of being self-employed is the flexibility I have in my schedule and the time it affords me to be with my two small children. I also love being able to choose which projects I work on, and where I direct my interest and time. Being creative for me is more of a genetic pre-disposition than a lifestyle choice so after years of trying to fit into 9 to 5 job boxes I let go and succumbed to this life. The main problem with all this creativity and freedom is the lack of steady income. Making ends meet each month simply does not happen in our house, but we lead a simple life and make due with what we have. Given some other kind of option, I would still choose this way I work as a creative professional. I find so much solace in making things with my hands. 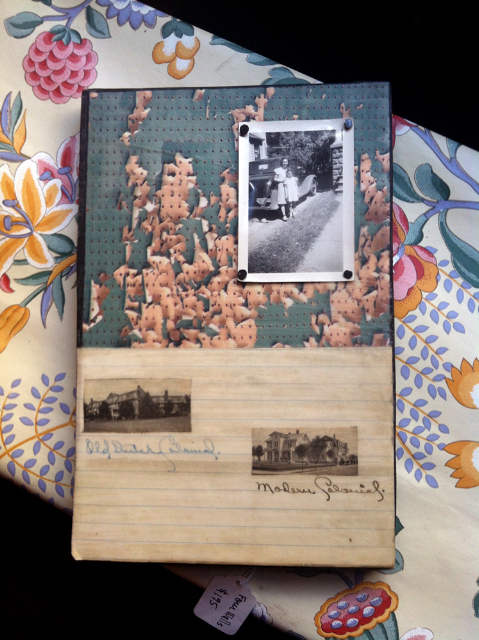 The process of creating a new work from finding the wooden canvas, to sanding and priming it, to sorting through piles of found ephemera is the biggest part of the work for me, with the final piece being the documentation of the development of the work. I find inspiration in each step of the process, and in my yearning for quieting my mind through creating my work. 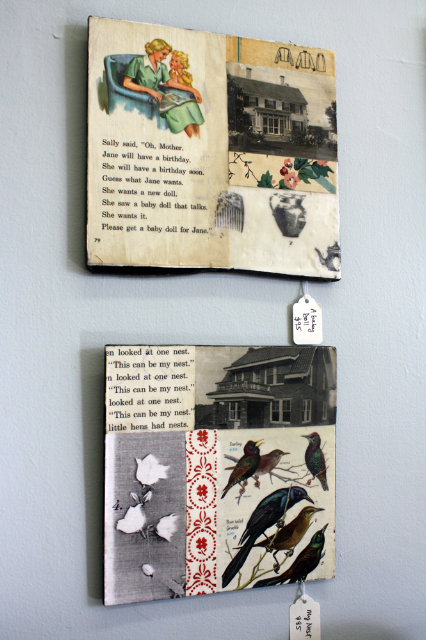 There has been a resurgence of interest in handmade work over the past decade. My theory is that the more society becomes digitized and disconnected from live experiences the more people yearn for things made by hand. Oh my gosh. Not possible to choose one. I can say that my favorite handmade gift experience was when I was pregnant with my son and my weekly knitting group threw me a surprise baby shower of sorts and each one of the group members made my unborn son a toy or article of clothing. It was the most special moment and we still cherish and play with those toys. When you are not making art, what do you like to do with your time? Laughing with my children and knitting are definitely two of my top non-art activities. Because my work is my art and I have created a business where I make and exhibit my work, while also supporting other arts businesses with marketing and PR initiatives and directing Boston Handmade, I am lucky that my time is largely doing things I like. I think of myself as a very lazy person. Carve out a dedicated workspace and make a work schedule and stick to it! If your creative business is something you truly want to do you will find the time and space to do it. But without time and space it will never get off the ground. Be sure to check out Jessica’s shop. Also, if you are in the Boston area and would like to see her work in person and meet Jessica, she will be doing two Artist Nights at the Liberty Hotel in Boston (215 Charles Street) on Tuesdays, May 14 & 21, both from 5:00-8:00pm. I also learned that word, had never heard it before!